March 15, 2015 By This post may contain affiliate links. Celebrate St. Patrick’s Day by serving a 4 Leaf Clover Sausage, Egg, and Cheese Breakfast Pizza. This dish will surely impress your family, with your creativity and cooking skills! That’s how my Irish mother would greet us kids as we came into the kitchen for breakfast on St. Patrick’s Day. When I was asked by Bob Evan’s to create some festive food for St. Patrick’s Day, my first thoughts went to breakfast because of my fond memories of eating Bob Evan’s sausage at our morning meal. As a kid, my favorite way to eat breakfast sausage was smothered in syrup alongside pancakes or waffles. As I grew up, I began to appreciate sausage and eggs smothered in cheese, as well. So, I created a festive 4 leaf clover shaped breakfast pizza stuffed with sausage, eggs, and cheese to celebrate St. Patrick’s Day and I shared the recipe on the Bob Evan’s website. (Update, the recipe was removed, so here it is). 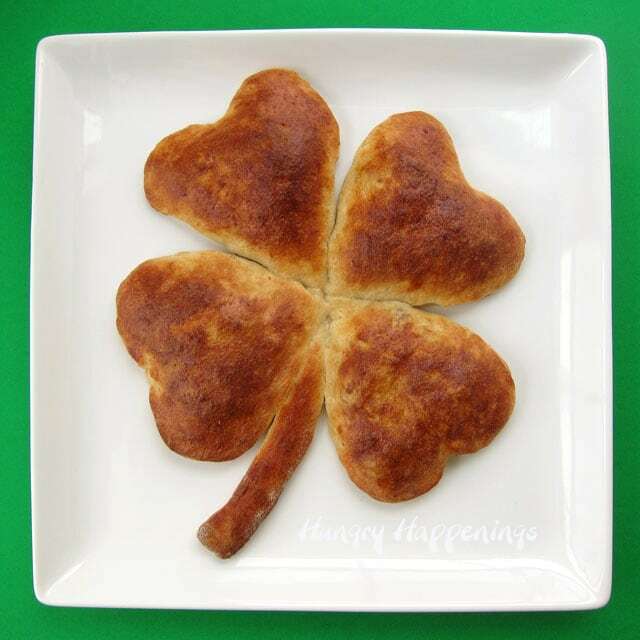 Pizza crust cut into a 4 leaf clover stuffed with sausage, egg, and cheese makes a festive breakfast for St. Patrick's Day. Dust cutting board with flour. Unroll one tube pizza dough onto cutting board. Cut 4 large, 5 ½ inch hearts and one or two stems out of the dough. Arrange the four hearts into a 4 leaf clover, so that the points of the hearts touch on a parchment paper lined baking sheet. Add a dough stem in between two of the hearts. Whisk together the egg white and water. 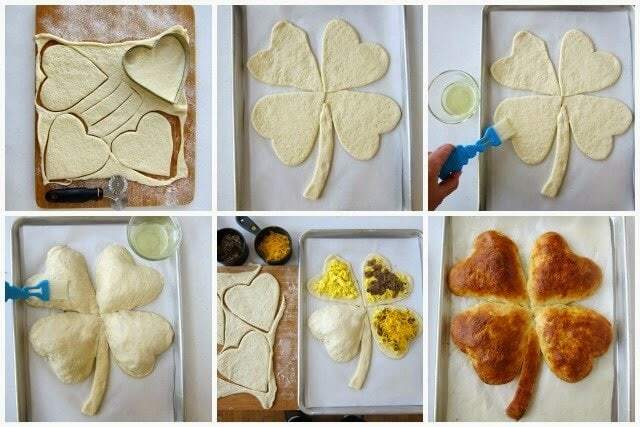 Brush the egg wash over the 4 leaf clover pizza dough. Spoon ¼ cup sausage, ¼ of the scrambled eggs(1 egg,) ¼ cup shredded sharp cheddar cheese in the center of each heart, leaving about an inch boarder of uncovered dough. Top the stem with another dough stem. Dust cutting board with flour. Unroll one tube pizza dough onto cutting board. Cut 4 large, 5 ½ inch hearts out of the dough. Cover each sausage, egg, cheese topped heart with a dough heart. Press the edges of the dough together to seal. Brush egg wash over the entire surface of the 4 leaf clover. Bake for 18-22 minutes until deep golden brown, and baked through. 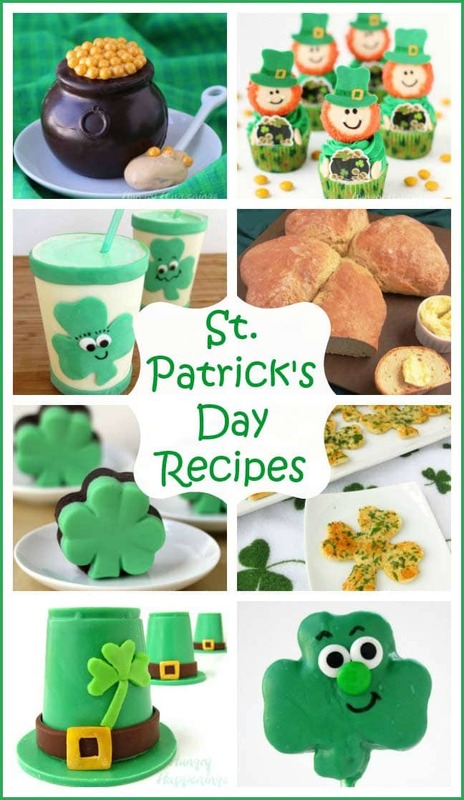 M family would love if I made a cute and delicious four leaf clover like this savory one! This looks fantastic! Unfortunately, Bob Evans changed their URL, so your link is broken. Even worse, the only thing I could find on their website was the prep/cook time and nutrition/allergen information – no ingredients or recipe steps! Any chance you could fill in the missing information so I can make this beautiful shamrock for my family on St. Patrick’s Day? Thanks for letting me know that the recipe was removed. I have added the recipe to the blog post. Let me know if you have any questions.